The dome is required to provide protection to the telescope in inclement weather and during the day. A number of concepts for the dome were evaluated within the E-ELT phase B. The baseline concept for the 40m-class E-ELT dome is a nearly hemispherical dome, rotating atop a concrete pier, with curved laterally opening doors. This is a re-optimization from the previous design, aimed at reducing the costs, and it is being revalidated to be ready for construction. In terms of astronomical performance the dome is required to be able to track about the 1-degree zenithal avoidance locus and preset to a new target within the allocated 5 minutes for the preset. This requires the dome to be able to accelerate and move at angular speed of 2 degrees/s (the linear speed is approximately 5 km/h). The dome is designed to allow complete freedom to the telescope to position itself within the dome whether it be opened or closed and to permit observations from zenith down to 20 degrees from the horizon. The dome has a height of nearly 74 meters from the ground and 86 meters of diameter. For the observing slit, two main designs were under study: one with two sets of nested doors, and the current baseline design, i.e. a single pair of large sliding doors. 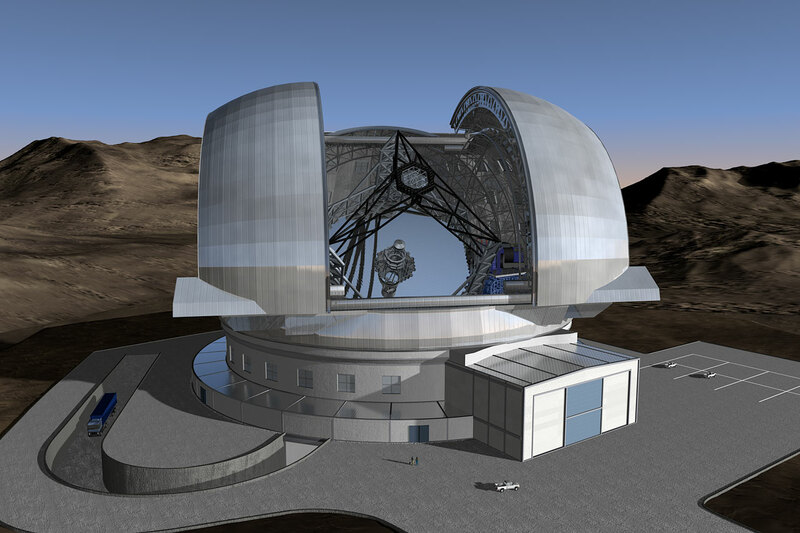 This pair of doors has a total width of 45.3 m.
With such a large opening the E-ELT dome requires the presence of a windscreen to protect the telescope primary and other mirrors, other than the secondary, from direct exposure to the wind. The baseline design of the windscreen minimizes the volume required to house it. Two spherical blades, either side of the observing slit doors, slide in front of the telescope aperture to restrict the wind. The dome design ensures that the dome provides sufficient ventilation for the telescope not to be limited by dome seeing. For this the dome is also equipped with louvers and the windscreen is designed to allow the louvers of the main dome to fullfill their function. Computational fluid dynamic simulations and wind tunnel work are carried out to study the airflow in and around the dome and the effectiveness of the dome and windscreen in protecting the telescope. Beside being designed for water-tightness, air tightness is also one of the requirement as it is critical to minimize the air-conditioning load. The air-conditioning of the dome is necessary not only to thermally prepare the telescope for the forthcoming night but also in order to keep the telescope optics clean. 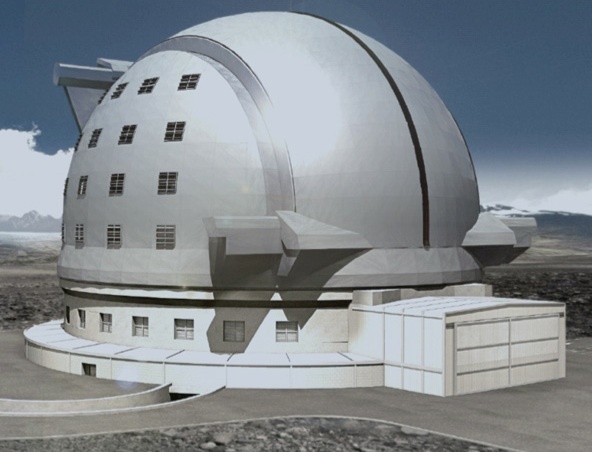 The airconditioning of the telescope during the day has been considered critical and the current specifications permit the dome to cool the telescope and dome internal volume by 10°C during 12 hours.